- WCW Clash of the Champions XXII (January '93) = The Hollywood Blondes (Austin & Pillman) lost, via DQ, to the NWA & WCW Tag Champs, Ricky Steamboat & Shane Douglas. - WCW Superbrawl III ('93) = The Hollywood Blondes defeated Erik Watts & Marcus Bagwell. - WCW Slamboree '93 = The Hollywood Blondes retained the WCW Tag Titles, defeating Dos Hombres (Ricky Steamboat & Tom Zenk) in a Steel Cage match. - WCW Clash of the Champions XXIII (June '93) = The Hollywood Blondes lost a "Three Falls" Match to Ric Flair & Arn Anderson. Since one of the falls was a DQ, the Blondes kept the NWA & WCW Tag Titles. 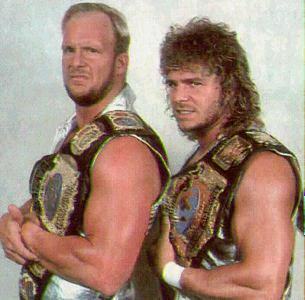 - WCW Beach Blast '93 (July 18) = The Hollywood Blondes stayed the WCW Tag-Team Champions, winning over Paul Roma & Arn Anderson.